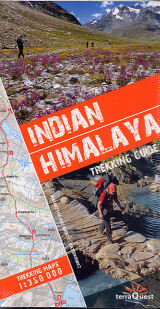 Detailed descriptions of 22 trekking routes in the Indian Himalaya. The routes have been especially devised to pass through the most scenic and culturally intersting regions of norther India. The information on the distance and time needed to cover particular route sections makes it easy for experienced trekkers and trekking novices alike to plan their trip in great detail. Each trek includes a 1:350 000 sale map and a height profile diagram.